So I think March is cursed. These past two weeks have been some of the toughest I’ve had in recent history, both personally and professionally, and so when I was offered a night at the circus? YES PLEASE. Let’s escape, I’m ready for trapezes and clowns to distract me from my own messes. So off we went to the big tent, err, Verizon Center for a night of magic and performance with the Ringling Bros and Barnum and Bailey Circus. In short? It was exactly what I needed. It may have been a touch cheesy, but it was surprisingly more Cirque than Disney on Ice on the scale. Most of the acts really DID have me on the edge of my seat, or impressed with the acrobatics, and I thoroughly enjoyed the silly musical numbers if only because there was so much to watch – from clowns, mini horses, motorcycles, goats, spinning teacups and one random porcupine, the show truly had it all. My favorite acts were the ones of human feats (not to be confused with feet, thank you) I loved the dancers in the hanging rings, the trapeze artists, and the motorcycle on a wire. One of my favorite acts were a group of guys who bounced on tubes between their legs. Random sounding, I know, but they straddled one big rubber tube between thier legs and were able to do flips, bounce around, over, and switch from tube to tube in the air. I also loved the dog tricks act. I’ll get fascinated sometimes by dog competitions on Animal Planet, so this was perfect for me. The puppies were diving through the air, jumping, running and catching every Frisbee thrown. Going through obstacle courses at the canine speed of light. The next act that made me gasp was the motorcycles in the small cage. Typical circus, but it’s pretty crazy to watch live. They got up to 7 motorcycles going around in that cage, and I was on the edge of my seat the entire time. Maybe because I’m a chronic worrier, but mostly because it was shocking and awe-inspiring. The pole vaulting acrobats were really creative too! Much more fun to watch than your average high school track pole vaulter, they were able to jump from stick to stick, from stick to rope, and two on a stick at a time. Last year, WLDC author Ben S wrote a review about his experience at the circus being saccharine, and although it wasn’t without it’s sticky-sweet moments, I had a genuinely good time. I left smiling, my bad few weeks having been temporarily pushed out of my mind. And isn’t that exactly the point? Looking for an escape, or a bit of a thrill? 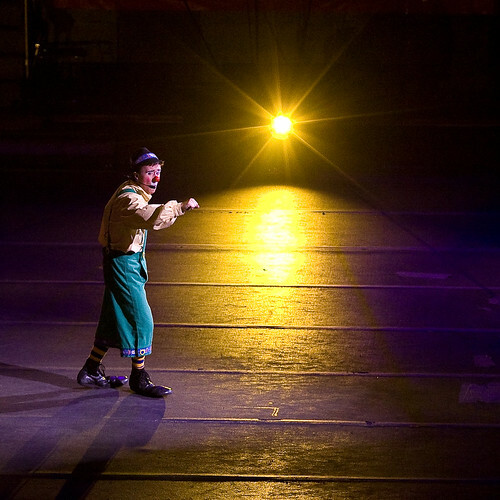 Take a trip to the circus while it’s in town from March 19-21st at the Verizon Center. There are showtimes three times a day most days. Click here for tickets. I am glad you enjoyed your night, however even though the Ringling Bros and Barnum and Bailey Circus claims to be the greatest show on earth it is mistaken. Every fall The Big Apple Circus come to town and put on on of the most enjoyable shows. It is a one ring circus in a tent and lets you return to the time on being a little kid.